Want to cook something different and easy this weekend? Try the Spinach Frittata. 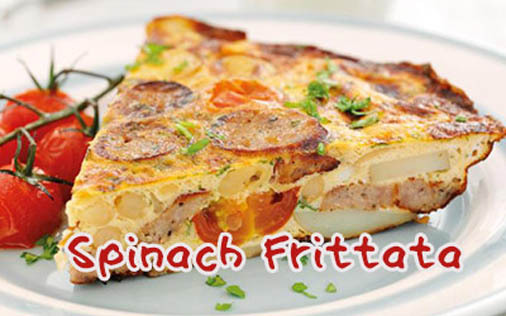 A frittata is an omlet, Italian style. - Preheat oven to 400 def F. In a bowl, whisk together eggs, milk and cheese. Add tomato, salt and pepper. Keep aside. In a pan, saute onion and garlic. When translucent, add spinach and cook for 2 minutes. Pour the egg mixture over the spinach mixture. When it's half done, transfer it to an oven-proof greased dish and bake it for a few minutes till the frittata is puffy and golden colour. Remove and wait till the dish cools a bit. Frittata is ready to be served! Optional - you can sprinkle a few pieces of goat cheese on the frittata before baking.